Black Mask: Will He Appear in Gotham City Sirens? Is Black Mask Heading to Gotham City Sirens? Back in December, it was announced that fans were getting a Gotham City Sirens movie from Suicide Squad director David Ayer. He’s re-teaming with Margot Robbie, who will reprise the role of Harley Quinn. We may know who’s playing the villain as well. 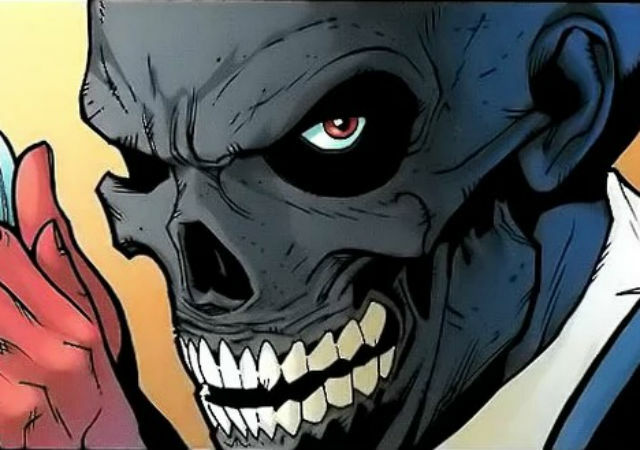 Ayer just tweeted a picture of the DC Comics character Black Mask, though he didn’t include any text. The picture is from the comic “Batman: Under the Red Hood.” Does this mean he’ll be in the film? RELATED: David Ayer and Margot Robbie are reteaming for a Gotham City Sirens movie! If you’re not familiar with the character, Black Mask is the alter-ego of Roman Sionis. Sionis’ wealthy parents were contemporaries of Thomas and Martha Wayne, so he spent time with Bruce Wayne as a child. His parents were less concerned with bringing him up than they were with their appearances. A series of accidents that harmed Sionis were covered up to preserve their reputation. He killed his parents and took over their cosmetics company. After a failed business venture deformed a number of women, Wayne offered to bail out the company, and Sionis resented him for it. He smashed his father’s casket in his parents’ crypt and carved himself a mask, taking on the persona of Black Mask. He became a crime lord, leads the criminal band called the False Face Society, and is one of Batman’s enemies. Black Mask has appeared in the animated series The Batman, the animated film Batman: Under the Red Hood and the Batman: Arkham Asylum video game series. The character has been featured in various forms of media, including the cartoon television series The Batman, the animated film Batman: Under the Red Hood, and the Batman: Arkham video game franchise. Check out the tweet below. Suicide Squad just won an Academy Award for Best Makeup and Hairstyling. Gotham City Sirens will be written by Geneva Robertson-Dworet, whose upcoming films include Tomb Raider (starring Alicia Vikander as Lara Croft) and Sherlock Holmes 3 with Robert Downey Jr. and Jude Law. Jon Berg and Geoff Johns are producing, with Robbie on as executive producer. It will likely feature characters like Catwoman and Poison Ivy, as well as other female DC superheroes if the comic series by Paul Dini and Guillem March is what they’re going with. The next DC film on the slate is Wonder Woman, directed by Patty Jenkins on June 2, 2017, followed by Justice League, directed by Zack Snyder, on November 17. Which characters do you want to see in Gotham City Sirens? Do you think this means we’re actually getting Black Mask in the film? Who do you think should play the role? Let us know in the comments or tweet us @ComingSoonnet!